Depicts the historic horseback ride of soldier and statesman Caesar Rodney, delegate to the Continental Congress. On July 1, 1776, suffering from illness, Rodney embarked on the 80-mile journey to Philadelphia dramatically arriving at Independence Hall the next morning just in time to cast a deciding vote in favor of the resolution of independence. Inscriptions: Caesar Rodney and The First State. Depicts the statue "Commonwealth," an outline of the state, the state motto, and a keystone. The statue "Commonwealth," sits atop Pennsylvania's state capitol dome in Harrisburg, Pennsylvania. The image of the keystone honors the state’s nickname, "The Keystone State," a testament to Pennsylvania’s contributions to the economic, social, and political development of the United States. Inscription: Virtue Liberty Independence. Depicts General George Washington and members of the Colonial Army crossing the Delaware River. Washington's legendary crossing on December 25, 1776 during the American Revolutionary War, was the first move in a surprise attack against the Hessian forces in Trenton. Based on the famous 1851 painting by Emmanuel Leutze, the image commemorates the role of New Jersey in these pivotal moments in the nation’s history. Inscription: Crossroads of the Revolution. Depicts a silhouetted outline of Georgia, Oak branches (the official state tree) and a peach. Nicknamed “The Peach State,” Georgia's peach industry has a long tradition. Franciscan monks introduced peaches to the region in the 16th century and by the mid-1700s they were being cultivated by the Cherokee Indians. Today the peach is one of Georgia’s most important crops and it is the third largest producer in the country. Inscription: Wisdom, Justice, Moderation. Depicts a Minuteman of the American Revolution against an outline of the state. The image is based on the "Minuteman" statue standing in The Minuteman National Historical Park in Concord. The Minutemen forces were made up of regular farmers and colonists, called Minutemen because they were trained to assemble and fight on just a minute's notice. Inscription: The Bay State. Depicts the Maryland Statehouse surrounded by White Oak leaf clusters. The Maryland Statehouse is steeped in history. From 1783-1784, the Maryland Statehouse served as the nation's first peacetime capital. Even the Statehouse lightning rod has a history. It is a "Franklin" rod, and it was built to Benjamin Franklin's specifications at a time when the nature of electricity was just beginning to be understood. The building serves today as the country's oldest state capitol building still in legislative use. Inscription: The Old Line State. Depicts a Palmetto Tree, the Carolina Wren and the Yellow Jessamine over an outline of the state. The importance of the Palmetto Tree, the state tree, dates back to the Revolutionary War when colonists in a small fort built of Palmetto logs successfully defeated a British fleet trying to capture Charleston Harbor. Inscription: The Palmetto State. Depicts "The Old Man of the Mountain" a distinctive rock formation on Mt. Cannon in the Franconia Notch gateway to northern New Hampshire. Until it crumbled in early 2003, the unique formation was one of the state’s most popular attractions. Natural freeze and thaw cycles had weakened the formation over the years and extensive efforts to preserve the beloved landmark with chains, steel rods, concrete and weatherproofing were ultimately unsuccessful. Inscriptions: Live Free or Die and Old Man of the Mountain. Depicts the three ships, Susan Constant, Godspeed, and Discovery that brought the first settlers to Jamestown, the first permanent English settlement in what would become the United States. The ships made landfall in May 1607 at a place they named Cape Henry. The original colonists suffered extreme hardships with only 61 of the original 500 surviving the first three years. Inscriptions: Jamestown 1607-2007 and Quadricentennial. 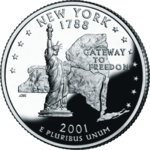 Depicts the Statue of Liberty superimposed over an outline of the state bordered by 11 stars signifying that New York was the eleventh state to enter the Union. The imagery celebrates New York both as a symbol of freedom and as the point of entry for generations of immigrants. From 1892 to 1954, over twelve million people entered the United States through the portal of Ellis Island, a small island in the shadow of the Statue of Liberty. Inscription: Gateway to Freedom. Depicts the “Wright Flyer” the world’s first powered, heavier-than-air machine to achieve controlled flight. Designed and built by the Wright brothers, the historic first flight took place December 17, 1903 near the Kill Devil Hills, about four miles south of Kitty Hawk. The Flyer flew four times that day ultimately completing a run of 852 feet in 59 seconds. Inscription: First Flight. Depicts a sailboat gliding through Rhode Island's famous Narragansett Bay, and the Pell Bridge in the background. The design pays tribute to Rhode Island's most popular sport—sailing. Known as the sailing capital of the world, Rhode Island was home to the America's Cup for more than 50 years. Inscription: The Ocean State. Depicts a Vermonter tending his sap buckets among the maple trees with Camel's Hump Mountain in the background. The production of maple syrup and other maple products is a thriving tradition that signals the arrival of spring in Vermont. In the early history of the country, maple sugar was the principal sweetener in North America. Although it has been largely replaced by cane and corn sugars, the maple sugar trade remains a vital part of the Vermont economy. Inscription: Freedom and Unity. Depicts a thoroughbred racehorse and Federal Hill the stately home which was the inspiration for Stephen Foster’s famous ballad and now the state song “My Old Kentucky Home.” The racehorse signifies Kentuckian’s pride in the state’s hosting of the Kentucky Derby and its heritage in thoroughbred horses. Inscription: My Old Kentucky Home. Depicts three instruments and three stars. The stars symbolize Tennessee’s three regions. The instruments symbolize each region’s distinct musical style. The fiddle represents the Appalachian music of east Tennessee, the trumpet stands for the blues of west Tennessee for which Memphis is famous, and the guitar is for central Tennessee, home to Nashville, the capital of country music. Inscription: Musical Heritage. 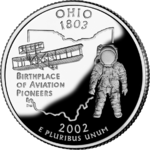 Depicts an early aircraft and an astronaut, superimposed on the outline of the state, honoring Ohio's contributions to the history of aviation. Astronauts Neil Armstrong and John Glenn were both born in Ohio, as was Orville Wright, co-inventor of the airplane. On March 1, 2002 two astronauts with Ohio ties, Nancy Currie and Richard Linnehan carried Ohio state quarters into space on the shuttle Columbia on an 11 day mission to repair the Hubble Space Telescope. Inscription: Birthplace of Aviation Pioneers. 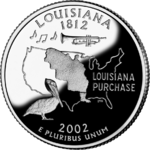 Depicts a pelican, Louisiana’s state bird, a trumpet with musical notes, and the outline of the Louisiana Purchase territory. Although Louisiana's official nickname is "The Pelican State," pelicans had disappeared from the Louisiana coast by the mid-1960s driven away by pesticides. However, after a successful repopulation effort there are now about 40,000 of the birds living in the state. The Louisiana Purchase of 1803 was a pivotal moment in the history of the United States, nearly doubling its size and making it one of the largest countries in the world. The trumpet and musical note are a tribute to the state's association with jazz music heritage. Inscription: Louisiana Purchase. 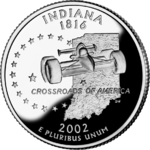 Depicts a racecar superimposed on an outline of the state reflecting state pride in the famous Indianapolis 500 race. Held Memorial Day weekend each year at the Indianapolis Motor Speedway, the Indy 500 is synonymous with automobile racing. The design also includes 19 stars which symbolize Indiana as the 19th state admitted into the Union. Inscription: Crossroads of America. 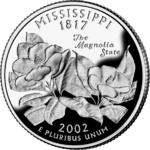 Depicts two magnolias, the state flower. Although they are not native to North America, magnolias have become a powerful symbol of the southern United States and are a particular favorite of Mississippians. Inscription: The Magnolia State. Depicts a young Abraham Lincoln within the outline of the state, a farm scene and the Chicago skyline. 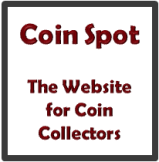 The image is based on “The Resolute Lincoln” a bronze statue by sculptor Avard Fairbanks. 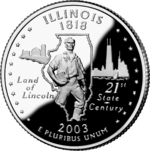 The twenty-one stars bordering the coin symbolize Illinois as the 21st state to be admitted into the Union. Inscriptions: Land of Lincoln and 21st Century State. 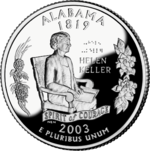 Depicts an image of Helen Keller with her name in both standard lettering and Braille - the first U.S. circulating coin to feature Braille. Despite her losing her sight and hearing to illness as a young child, Helen Keller learned to speak and read, and became the first deafblind person to earn a Bachelor of Arts degree. She became an advocate for disabled persons and women. Inscriptions: Helen Keller and Spirit of Courage. Depicts the Pemaquid Point Light Station and a schooner at sea. One of Maine's most popular tourist attractions, the Light Station is located in New Harbor and marks the entrance to Muscongus Bay and Johns Bay. The point was the scene of many shipwrecks through the centuries, including the 1635 wreck of the British ship Angel Gabriel. 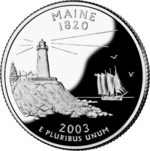 The first lighthouse at the station was commissioned in 1826 to provide improved safety for the increasing maritime trade, fishing, and the shipping of lumber along the Maine coast. 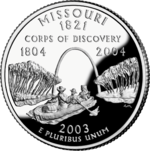 Depicts Lewis and Clark’s historic return to St. Louis down the Missouri River, with the Jefferson National Expansion Memorial (Gateway Arch) in the background. Lewis and Clark’s 8,000 mile journey to explore the uncharted Louisiana Purchase territory began in St. Charles, Missouri -- just 20 miles west of St. Louis -- in 1804 and ended when they returned to St. Louis, Missouri in 1806. Inscription: Corps of Discovery 1804-2004. 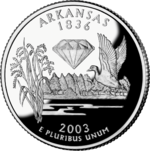 Depicts the image of rice stalks, a diamond and a mallard flying above a lake celebrating Arkansas’ nickname as the "Natural State." Arkansas has more than 600,000 acres of natural lakes. The state boasts the oldest diamond mine in North America. Crater of Diamonds State Park is the only diamond-producing site in the world open to the public and visitors get to keep what they find.